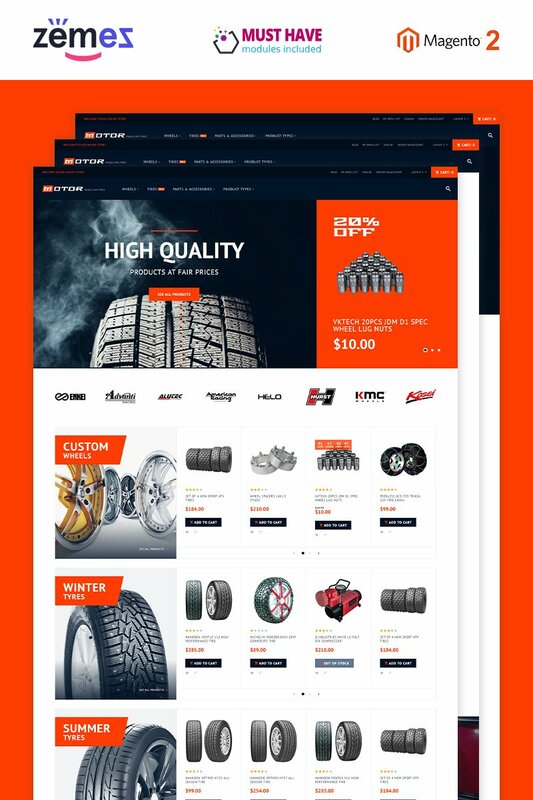 Meet Motor, a feature-rich and beautiful Magento 2 theme for online stores that specialize in selling tyres, wheels, and other car parts and accessories. The theme comes with a set of features that improve the functionality of your store and make it more user-friendly. Highlight all of your categories and sub-categories with the help of MegaMenu module. Now your visitors can search through your inventory located in one place, finding exactly what they want faster. The site's search engine enhanced with Ajax facilitates the search process by suggesting the search results simultaneously as you type your query. Your shopping cart is also Ajax-based, meaning you can add products in there without having to leave the page. Wheels & Tyres is a fully responsive solution that looks great on all modern devices. Make the shopping process on your site more comfortable by letting your visitors make purchases directly on their mobile phones. The theme is a great choice for any professional Magento 2 store, so try it out now! Great service and easy to modify. Definitely recommend for your auto related project. This is a great and very complete theme. The extensions included are super useful and basic for an online store, the ones I used are ok, no bugs so far. I have no problems installing the theme. Just a tip is to add the tutorial link in the documentation because i had to ask for it in the chat. Can the colors be changed to Red or Blue instead of Orange? Can I add the &amp;quot;quantity box&amp;quot; beside the &amp;quot;Add to Cart&amp;quot; button in the front page? Thanks!